I have bought this before just wish it was bigger. Bought this for a co worker. Our Family Tradition--thanks to Miles Kimball! A family tradition in our home, these little angels have adorned our tree since the first one I bought for my first child in 1982! Now, the year each of my grandchildren were born, I could count on Miles Kimball for the perfect personalized little Angel. This year was Grandchild #5....and I even ordered one for "Grandma Mary"--that's me! Wonderful little keepsake gift. Thanks, Miles Kimball, for still being there with traditional little things that mean so much! Bought for my son and grandsons. They are so cute on the tree. Great quality. Lovely ornament. Purchased for a new grandchild and will join the collection for all other family members. So pleased this ornament has been available one many years. This little angel is just what I needed, again sadly. I say sadly because it is the second year in a row that we had a great-grandchild born pre-term and not survive. This ornament is such a sweet little tribute to the wee ones that are not with us. I have the baby on the cloud ornament for the great-grands who are such a delight to us. 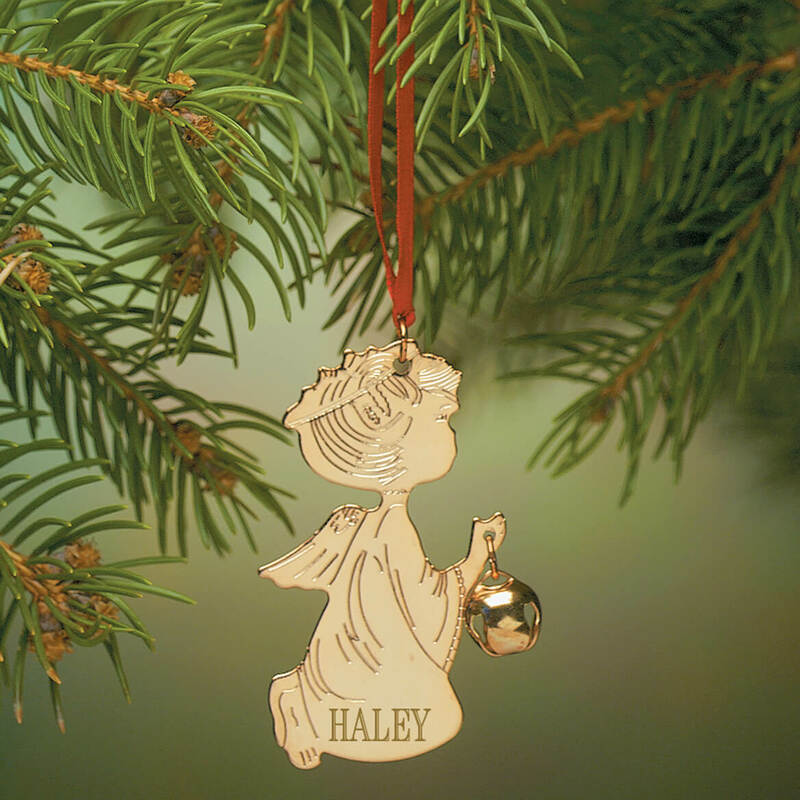 Our grandchildren have another style of personalized ornament-all alike-and my mother started the tradition by getting personalized ornaments for our children. Angel ornament nèeded 2 more to add to the the 8 we have. Everyone in our family has one with their name on it. I have one for each of my children and grandchildren. My grandchildren look forward each year to finding theirs on the Christmas tree. I have been buying this ornament for almost 38 years. I started with the very first Christmas after each daughter was born and continued until they were married. I know buy them for my granddaughters. They look so pretty on the tree and make a life long memory. They are, also, great gifts for nieces and little friends. Bought this for my daughter to match mine that was a gift in the 70's. Both are of great quality and should last my daughter for years to come as well. Great ornament for the price! I bought this for my grandson who died two years ago. I buy an ornament every year and I love this little angel. My family and I have really enjoyed our personalized kneeling Angel ornaments on our Christmas Tree. I like the fact that they all match,the personalization is always correct, and also very prompt and quick service. I have added all of our children and grandchildren kneeling angels.As we have another grandchild, I order another one. I hope that this item will stay in your inventory for years too come. Bless you all. Absolutely beautiful. Love it. Fast delivery. I first bought this angel ornament for my daughter on the occasion of her first Christmas in 1971, and then in duplicate for each granddaughter (one for each of them and one for myself) in 2000, 2003, 2008, and 2018. The first four were purchased from a catalog, this last one I recently ordered online with fantastic results. Love the preview page that shows exactly how the angel will look imprinted. Received the package of perfect angles quickly, all set for the holidays. Got these to hang on the Christmas tree, everyone who sees them wants one. Love it. I have bought one for each family member. 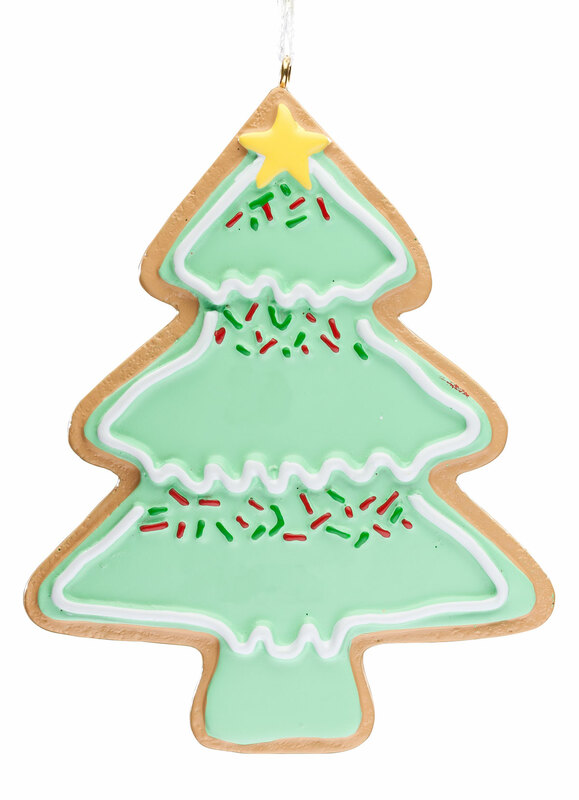 Teacher can decorate classroom tree and give each child his/her angel after Christmas. Bought it once, twice & I'd do it again! Bought this item about 1981 for my two older children, then had another child 1998 and searched to buy again. I still have them and now when my grown children come home at Christmas they look for their angel to place where they'd like to see it. I love it and will buy for my grand when they begin to arrive. I was very pleased with the personal engraving done. I love this ornament! I bought one for each of my 3 children when they where little. My youngest child is now 39. It gives me and my children such joy every year as we hang our angel on the Christmas tree. I now have an angel for my 3 grandchildren, brother, sister-in-law, sister, son-in-law and niece. 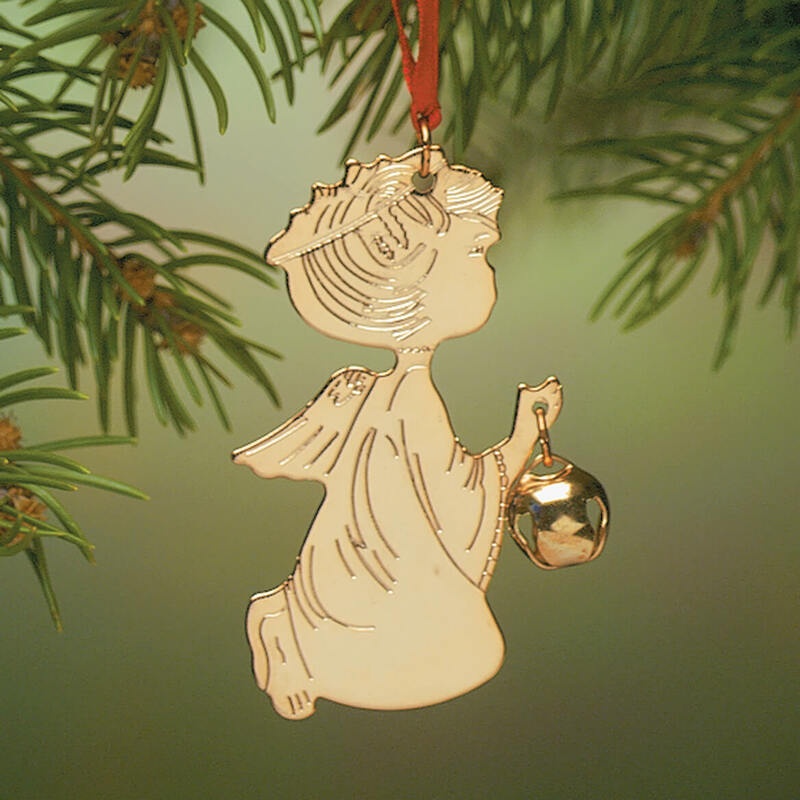 This angel ornament has created a family tradition for us, "Hang Your Angel." Ordered these as appreciation gifts for our Ladies Auxilary. A little small, but very pretty. Love these ornaments. My mom bought them for us as children & now I buy them for my kids. absolutly perfect, just like the ones i hung on the christmas tree when i was a kid. in fact i still hang that orginal ornament on the tree. now everyone has one to match. This is the same angel my Grandma ordered for us 30-years ago. When my 2 1/2 year old nephew opened his last Christmas he was excited to have an ornament "like yours", it is a great family tradition. I have looked for years for these precious ornaments. My parents decorated their tree with these angels personalized with their names and the names fo my siblings and their spouses, their children and my name as well as my husband. More of their grandchildren have been born and I wanted to include them in the collection for my tree. Never could find them until now. Delighted! I guess I should get started on their great-granchildren. My girls each had one of these growing up. Now I am continuing that tradition by giving them to my grandchildren. I get this ornament for all newcomers to the family. My husband and his sisters have one from years ago. Memory from my childhood . . . I have a few of these with my name on them from my childhood -- so I was excited to see that they are still made! One ended up in each of my children's stockings this year and they look lovely. Couldn't beat the [...]! I do wish there were an option to put both a name and the year on them -- I may go have the year engraved on the back after Christmas. Still Available 15+ years later! When I was a young mother, sons 2+4 I purchased these for all 4 of us in our family and we all loved using them year after year. Ten years later, we were once again blessed with another son. 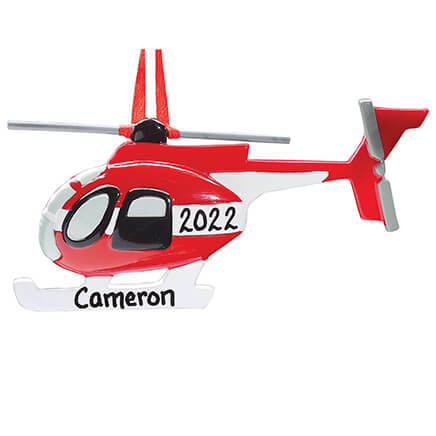 He is now 22 and I came across the ornament in the catalog last year and was able to order one for him as well. That provided us with all matching ornaments that will also make great keepsakes for years to come! Plus I can continue on with the wives and grandchildren too! I bought one of these for each of my kids 45 years ago and now am buying them for grandchildren to hang next to their parents on the tree! Thank you so much for continuing to keep quality merchandise. Got this for my granddaughter for her 1st Christmas. Both me and kids each have one. So glad to pass on the tradition. I bought these for my children and was thrilled to be able to get it for my grandchildren. 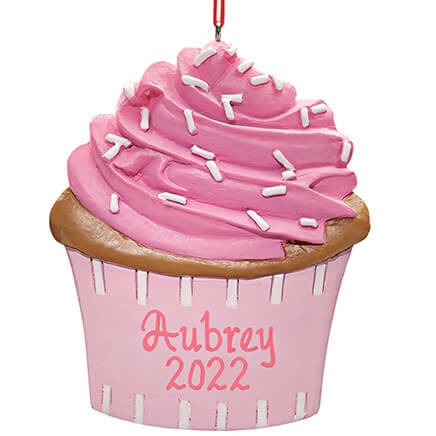 These individualized, small, attractive ornaments are personalize-able, durable and look great year after year --thank you for allowing me to continue this family tradition into the next generation. For our first granddaughter, who is a true little angel! I have this same ornament from my very 1st Christmas. 33 years later, I want the same one for my daughter. Tradition. Was supposed to be buy 2 get 2 free, didnt happen. I bought this for my daughter over 30 years ago. Now I'm buying one for my grandson. I like that it is still available to purchase. In the 1970's I had ordered this for my child and thought it would be fun to have them for all of her family. I ordered these years ago for my sons and now have ordered them for grandchildren! My grandmother got all 4 of her children their own "gold plated" ornament, my mom got me and my siblings our own, and now I'm continuning the tradition with my child. I hope they never stop making these! My siblings and I were given these from a family friend growing up and they still look new (I'm 58 yo). I wanted my children to have. I received this ornament when I was a child. I always liked it because it had my name on it. The personalization made it extra special to me. I was happy to see this classic is still available and ordered one for my own little girl! My mother-in-law collects one of these type of ornaments for each member of her family. Had 2 new great grandchildren this year and wanted something similar to those she has for other members. For My 5 Month Old Great Grandsons 1st Christmas. Our son passed away at birth. Our family has a tradition of buying ornaments for each family member each Christmas. We chose to include our son that passed away in that tradition because he still counts, even though he is no longer here. It is similar to an angel ornament that I had as a child. I wanted to get one for my daughter. My aunt gave my sisters and me these ornaments for Christmas 30-some years ago. Since then, my nieces and daughter each have them. Now we are working on the newest generation. These ornaments are adorable, they've been part of our family tradition for most of our lives. I received this ornament as a very young child. Since then I have purchased one for my husband, dogs and children! Has a special meaning for me personally. Each of our Great Grandchildren have one of these for their Christmas trees. 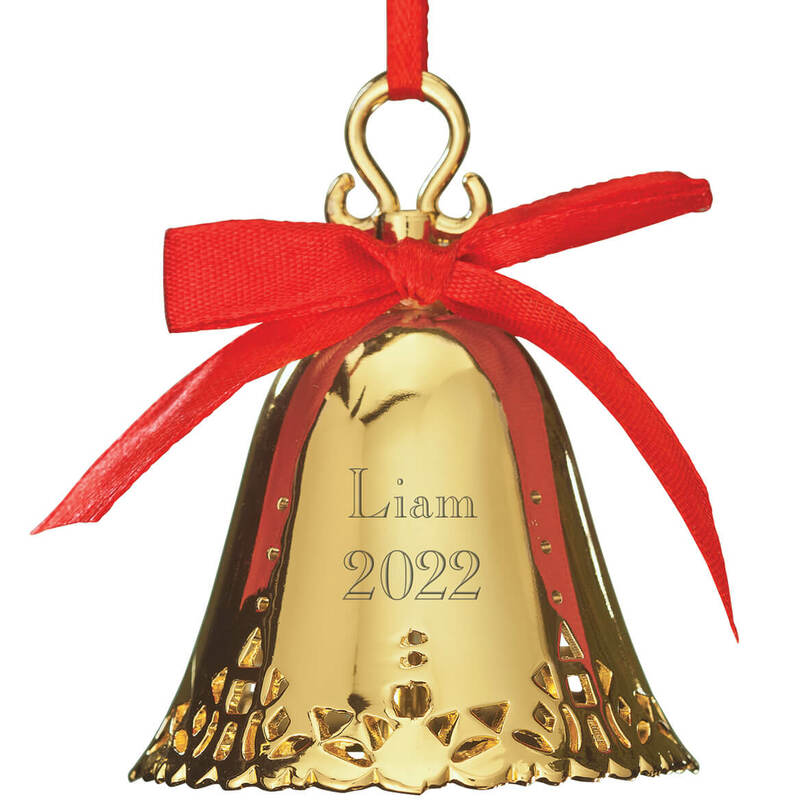 We have a collection of gold personalized ornaments from Miles Kimball that spans 35 years. We even made a wooden tree stand to display them all every year! My Mom bought these for my children. NowI am buying them for my grandchildren. Each female family member has this ornament on grandmom's tree going back over 30 years. Two new family members this year. I give a personalized brass ornament each year to my kids and grand kids, running out of options. Would like to see new options next year. 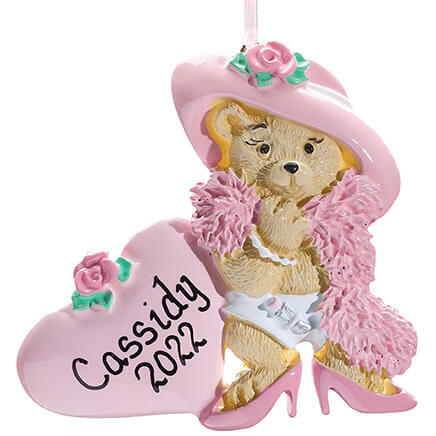 I have been ordering this ornament for my children, grandchildren and great grandchildren for 46 years. We also buy them for son or daughter-in-laws. Several have had to be replaced because they were lost. The angels are the first ornaments on the tree. Cute item for two sisters. I give personalized ornaments to family members from birth to HS graduation. Bought them for my own children when they were young. Starting on grandchildren, now! Each grandchild has one with their name on it which are hung on my tree each year. I purchased these same angel ornaments for my daughters when they were little, now I am buying them for my granddaughters! A family tradition...purchased one for each of my girls. They used to have the drummer boy as I have that for my son and would like to see them bring it back for sale once again. I wanted this too but it is also out of stock. Will these be restocked? My mom bought these for my sisters and me when we were little so I would love to get these for my daughters. When will the angel become available? I want to order three personalized angel. my mom got these for all of us growing up (we are 35-50 years old now). I would like to get these for all the grandkids. The ones my mom got were almost identical, but we had girl and boy versions. Do you have girl and boy versions or just the one shown? BEST ANSWER: Thank you for your question. This item is not offered in a girl/boy style. The only style available available is the one shown.We hope this information will be of help to you. How do you clean fingerprints off of the brass metal ornaments? BEST ANSWER: Thank you for your question. Soap and water will remove fingerprints. We hope this information will be of help to you. Pick up some Brasso which is a metal polish. The military uses it to keep their buckles and buttons in good condition. BEST ANSWER: Thank you for your question. Yes we do ship to Canada just select ship internationally in the checkout. We hope this information will be of help to you.